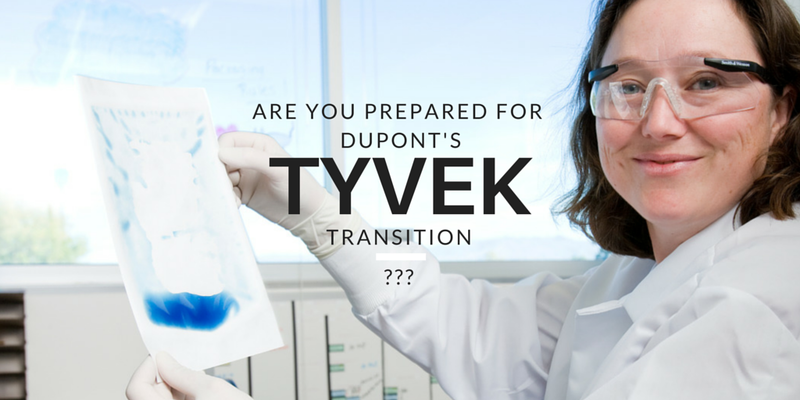 DuPont’s Tyvek Transition: Are You Prepared? With DuPont’s Tyvek transition looming, manufacturers should consider performing a packaging validation as part of their implementation strategy. Nelson Laboratories has been working with the new Tyvek material, testing it according to the ASTM F2638 method, for several years. DuPont has committed to help make this transition process seamless for sterile packaging manufacturers (SPMs), medical device manufacturers (MDMs), and the healthcare industry, carrying the lion’s share of time, money, and resources associated with establishing functional equivalency. For most manufacturers, the transition will not justify a full packaging re-validation – DuPont’s functional equivalency letter may provide much of the necessary justification. Throughout the Tyvek transition, manufacturers need to be asking, Is the new Tyvek material functionally equivalent once implemented in my unique packaging configuration? A consult with a qualified testing partner early in the implementation process may help manufacturers properly answer this question. A packaging validation will generally include three components: integrity testing, strength testing, and microbial barrier testing. The options for strength and integrity remain the same, but manufacturers have a new option when it comes to microbial barrier testing – ASTM F2638, Standard Test Method for Using Aerosol Filtration in Measuring the Performance of Porous Packaging Materials as a Surrogate Microbial Barrier. ISO 11607 Packaging for Terminally Sterilized Medical Devices indicates all sterilizable medical packaging materials need to provide an effective microbial barrier. The method traditionally used to determine if packaging materials meet this requirement has been ASTM F1608, Microbial Ranking of Porous Packaging Materials, and DIN 58953-6. But the lesser known ASTM F2638 is well suited to testing the filtration efficiency of the new Tyvek material, and should be considered as a viable test option. ASTM F2638 is a nice addition to the family of package testing methods, as it tests materials at real world flow rates. Or in other words, the standard recommends rates that are more representative of the level of exposure the packaging might endure in a real world setting. It also offers immediate results. Unlike test methods which use live organisms to test filtration efficiency, and therefore need an incubation period, ASTM F2638 uses particles, which means evaluation is based on particle counts which need no incubation, giving a speedy result. Nelson Labs offers clients unique access to both ASTM filtration efficiency test methods (ASTM F1608, and ASTM F2638), and has the experience and resources to perform the lesser known ASTM F2638 test. Contact Nelson Laboratories to discuss your package testing needs – sales@nelsonlabs.com, 801-290-7502. You may also be interested in watching Developing Your Packaging Validation and Plan, a complimentary on-demand medical device packaging webinar. About Craig Fisch: Craig Fisch is a Study Director at Nelson Laboratories. Craig is an expert in ASTM F2638 material qualifications and container closure integrity (CCI) testing. Since 2012, he has overseen integrity testing (ASTM F1929, ASTM F2096, CCI by Dye Immersion), microbial barrier testing (ASTM F2638), and the accelerated and real time aging processes (ASTM F1980) in Nelson Laboratories’ packaging department.